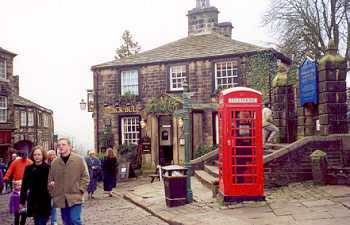 Haworth is a hilltop village not far from Bradford in the heart of West Yorkshire's Bronte Country. Situated above the Worth Valley on the edge of the bleak Pennine moors, Haworth is internationally famous for its connection with the Bronte sisters, who were born at the Bronte Birthplace in Thornton just outside Bradford, but who wrote most of their famous works while living at the Haworth Parsonage (which is now a museum owned and maintained by the Bronte Society) while their father was incumbent parson at the adjacent Haworth church. Several public footpaths lead out of the village, and there is much scope for rambling, though perhaps the most famous walk leads past Lower Laithe Reservoir to the picturesque (but unspectacular) Bronte Falls, the Bronte Bridge, and the Bronte Stone Chair in which (it is said) the sisters took turns to sit and write their first stories. This path (which forms part of the 64 km (40 mile) long Bronte Way) then leads out of the valley and up on the moors to Top Withens, a desolate ruin which was (reputedly) the setting for Heathcliff's farmstead in Emily Bronte's "Wuthering Heights". [N.B. Top Withens can also be reached by a shorter walking route departing from the nearby village of Stanbury.] Also nearby is Ponden Hall (which is believed to be the house called Thrushcross Grange in "Wuthering Heights"). Back in the village of Haworth itself there are many good tea rooms, souvenir and antiquarian bookshops, restaurants, pubs and hotels (including the "Black Bull" - where Branwell Bronte's demise into alcoholism allegedly began). As such, Haworth makes an ideal base for exploring the principal attractions of Bronte Country, while still being close to the major cities of Bradford and Leeds. Further afield lies the historic city of York, and the spa towns of Harrogate and Ilkley - popular spa towns on the edge of the very beautiful Yorkshire Dales National Park to the north. Please click here for links to other Haworth and Bronte Country related websites. Bronte Country is designed and maintained by Eagle Intermedia Publishing Ltd.